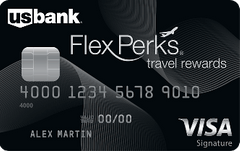 The U.S. Bank FlexPerks Travel Rewards Visa Signature card is a good value for cardholders who want to redeem points for travel purchases, but its other redemption options aren’t nearly as lucrative. The Marriott Bonvoy Brilliant American Express Card offers a lot of value in its first year thanks to a giant introductory bonus, but – if you’re not interested in luxury perks with Marriott hotels – you can find many rewards cards that offer better ongoing value. Designed for frequent travelers, the BMO Harris Bank Premium Rewards Mastercard offers a generous spending bonus on restaurant, hotel and airfare purchases and limited airport lounge access; however, cardholders need to spend relatively heavily to make up for the card’s $79 annual fee. The rewards earning rate on the Mastercard Titanium Card is low and it doesn’t offer a sign-up bonus, but cardholders can at least enjoy some of the luxury card program’s unique luxury perks at a relatively affordable $195 fee.